In December 2017, your Kareo Clinical account will be upgraded to the latest version. Each of this month's new features and enhancements are aimed to meet government standards for your Medicare reimbursement (so much as you choose to participate), enhance your ability to provide quality patient care, and improve the data in your reporting. Providers now have the ability to share comments on studies/imaging with the patient. When recording results on a studies/imaging, the provider can add one or more comments to the patient, and make the comments available for the patient once the results are signed off. Patient comments will be visible on printed results, and from the patient's portal. Keep an eye out for future releases, when the new patient comment field will also be available on paper labs and eLabs. Now providers may select to send either a Referral (for transitioning from a practice) or a Continuity of Care (for closing the referral loop). In addition to new demographics, the exports will also include the new fields of Goals and Health Concerns. 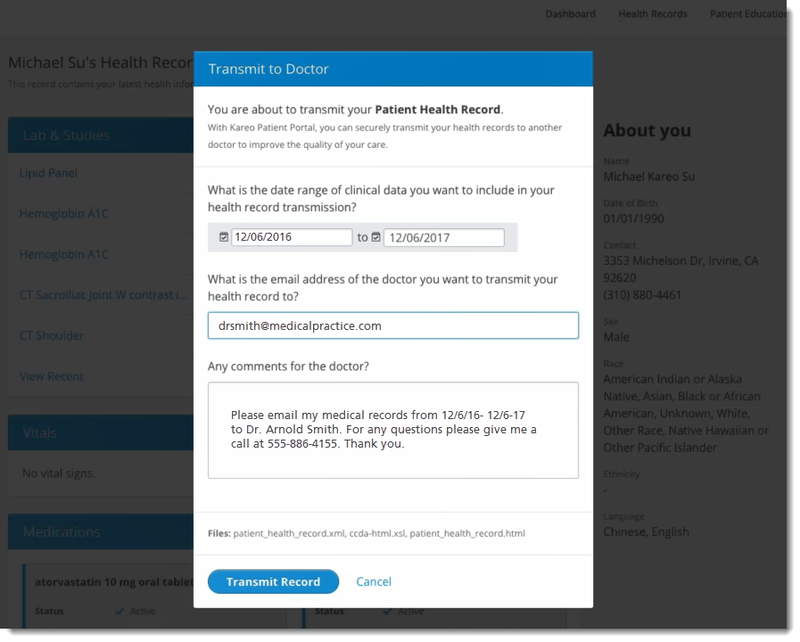 This new feature enhancement now enables patients to forward their health records to providers' and family members' regular email addresses from the patient portal. In addition, the patient will see a history of who they've sent their health records to or who has been granted access to their health records. From the patient portal homepage, actions dropdown list, you will see a new option to "Email Health Record." > Click to open the transmit records window, fill out the appropriate information and click "Transmit Record" to submit. As an added component to the 2015 Certification requirements, patients can now send secure messages with attachments to a provider from the patient portal. From the new message window, simply drag and drop any attachment into the message, fill out the appropriate fields and click "Send Secure Message." The provider will receive a new message alert and can click to open or, the provider can navigate to the patient facesheet > Documents, and view the message. As an added component to the 2015 Certification requirements, this feature enhancement allows providers to import either Summary of Care documents, Referrals, or PDF documents directly into Kareo documents when receiving these materials from other providers. In order for a provider to import documents from other doctors into the patient's EHR, navigate to Clinical Tasks > Direct inbox > and click on the new button, Import to EHR. Select the patient's name and click the import button to submit. Providers can see a history of any documents they have imported to patient EHRs. Navigate to the patient facesheet > Documents > Referrals tab. In addition to having the ability to print patient education materials while a patient is in office, the provider can now send electronic Patient Education materials to the patient as long as that patient has set up their patient portal. When clicking on the patient education icon from the patient face sheet, if the patient has access to the patient portal, Providers will see a new "Send" button. Select the information and click send. The patient portal will display a new section where the patient can click on "View Patient Education" to see the provider's sent information. Open API is now available for patients, and the open API key can be found in the right sidebar of each patient portal. Who may benefit from the use of the open API key? Third party developers or patients who are developing software applications for accessing Protected Health Information (PHI) of patients on the Kareo Platform. Updated vaccines in the Clinical module which impacted the providers’ ability to chart accurately.